Käyttöauto Oy is a Finnish, significant car sales retail chain, which currently operates in ten locations. Founded in 1970, and operating with Datsun at that time, Käyttöauto Oy is today a multi-storey house with more than 500 employees. Resale sales representations are from A to V in alphabetical order. The operating environment of the Käyttöauto is interesting and challenging as more and more of its branded vehicles are increasingly investing in electric and hybrid automotive technology. And there are no signs of decay in this trend, but obviously vice versa. Moving in a way or another with electric power has come to stay and further strengthen, as right now the technology lives at a stage where renewal and a faster pace of development are noticeable. 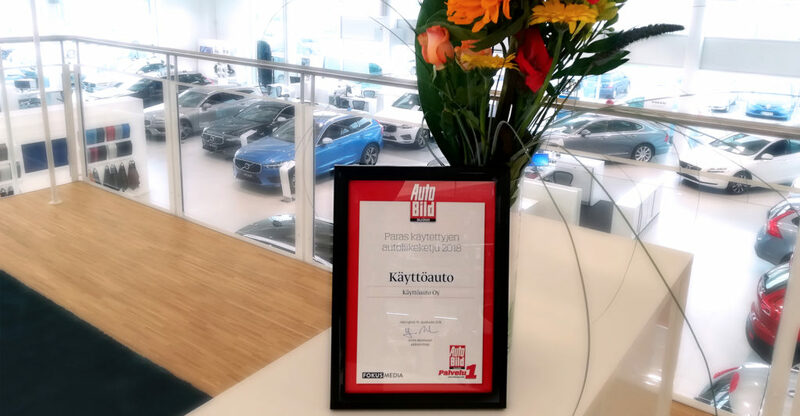 Käyttöauto has been selected as the best used car retailer in Finland for cars in 2018. Image: Käyttöauto Oy. As a matter of fact, for example, as a rechargeable electric vehicle, driving only remains on the user’s shoulders, as long as it’s time to remember to charge the vehicle’s batteries, but in a more specific way it is not that simple – at least for a responsible car dealership. The high voltages used in vehicles, often rising to hundreds of volts, place heavy demands on vehicle maintenance and, more broadly, in the automotive sector. If you are unfamiliar with the technology and/or know the potential dangers of high electrical voltages, it’s better to leave the system or equipment out of the question. Prodiags’s online learning on electric and hybrid vehicles technology provides a centralized, cost-effective, and personally interactive, total package where repair personnel can develop and update their knowledge of the impact of electric and hybrid vehicles on maintenance and repair. Interactive training, animated enrichment material has been developed especially from the mechanics point of view to meet the challenges of repair work. The focus is on safe, risk-free and professional handling of electric and hybrid vehicles, analysis of possible faults and maintenance in a workshop. Ari Siirilä, Training Manager at Käyttöauto Oy, sees ProDiags as a major contributor in electrical safety training for mechanics. According to Ari Siirilä, Training Manager at Käyttöauto Oy, the Prodiags learning environment provides a flexible, student-motivating, tailor-made training program tailored to the needs of the company, as well as a variety of training and integration activities. According to Ari’s view, training and the related end-of-work safety test create a well-functioning and strong foundation for all people working in mechanical tasks. Up-to-date and sufficiently comprehensive basic information makes it easier to internalize automotive and model-specific solutions, making working more natural, efficient, and understandably safer for both the mechanics and the immediate environment. With these experiences Ari Siirilä sees Prodiags on-line as a very useful alternative to other automotive training packages. Hi Gary, the courses are open to anybody with an interest in automotive technology. With buying and activating the courses you are a Prodiags member and you can buy new courses which will be available in your account. The dashboard will list the course and you can study the new course immediately or later. Any other question we might answer? Thanks for the feedback! It is our goal.